Copyright Licensing can no longer be considered purely from the perspective of the licensors home territory. This practical and wide-ranging reference work provides comprehensive coverage of the law and practice of cross-border licensing in a number of major territories, including China, the EU, India, Mexico, Russia, Singapore, South Africa, and the USA. The book, written by expert authors with insight from practice and from their home jurisdictions, focuses on both copyright licensing and competition law and, specifically, the inter-relation between these legal fields. 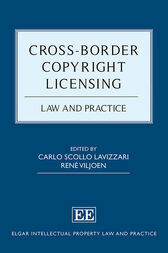 The book is uniquely structured to provide both thematic coverage and detailed analysis of each territorys applicable laws and regulations, highlighting and addressing the legal issues that are most critical in and relevant to licensing practice.Cross-Border Copyright Licensing is an essential starting point for anyone considering or advising on the implementation or enforcement of a copyright licensing program, in either developed and emerging markets.